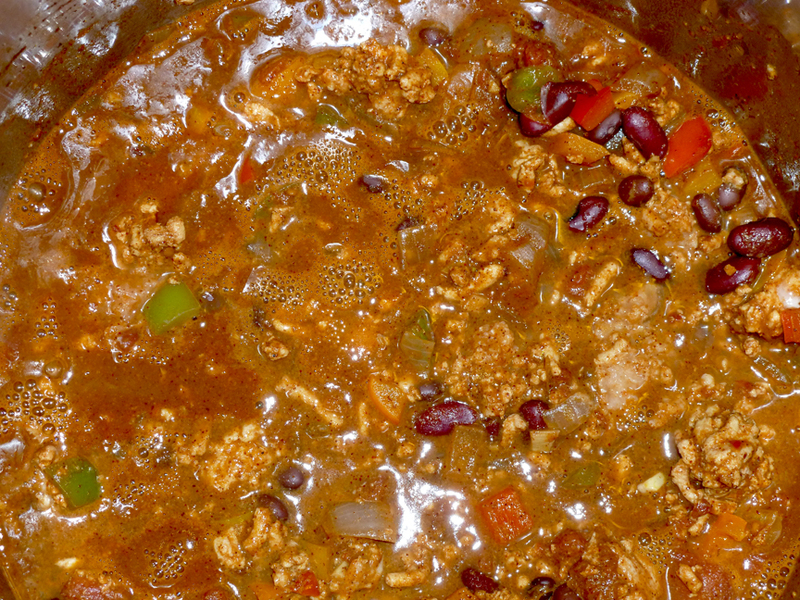 This delicious chili starts off with a multi-colored fiesta of bell and chipotle peppers. The fact that the first touch of cool weather turns my thoughts immediately to chili is one of the reasons I love the fall season so very much. 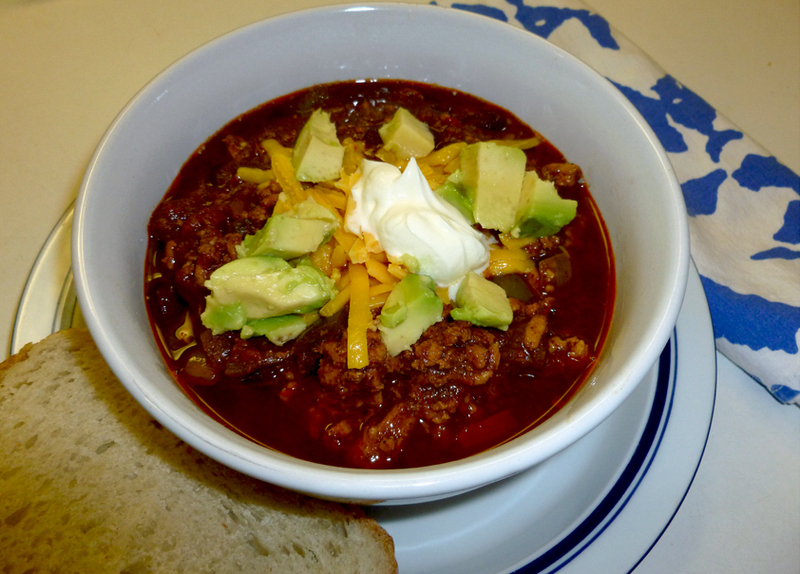 I crave chili, and I happen to make a really mean chili—if I do say so myself! It’s deceptively healthier than most, being filled with veggies and two kinds of fiber-loaded beans. It’s also made with ground turkey breast instead of beef. Well, yes…I can, but this particular recipe is REALLY better with turkey, and I know this because I first concocted the recipe with beef. 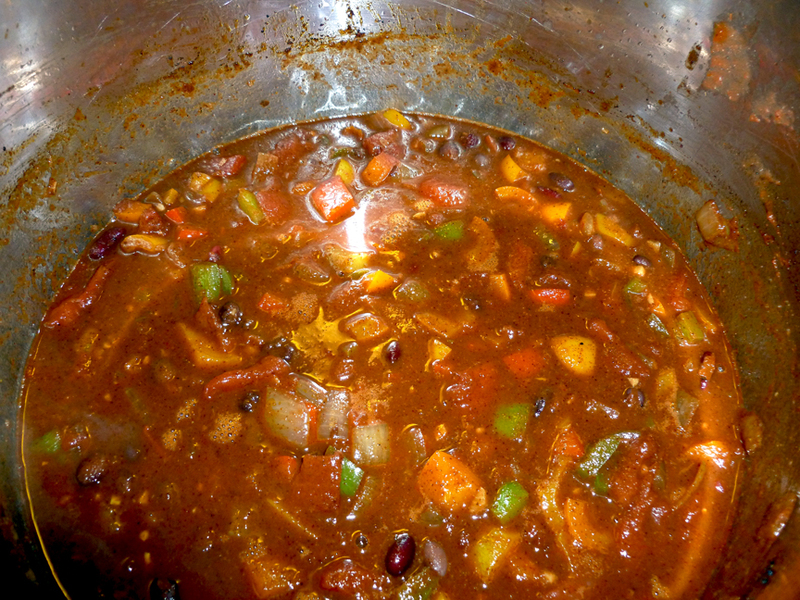 After the peppers and onions are cooked, you add the wet ingredients, beans and the chocolate. What makes this work so well and taste so decadent is the fact that it has chocolate in it. Though not really a mole, this is a mole-inspired chili, and traditionally a chocolate mole is served with chicken or turkey…so, you get the idea? The natural sweetness of the turkey and the rich bitterness of the chocolate are a delicious match made in…well, Mexico! When the wet ingredients come back to a boil, you add the turkey and cook for 35-45 minutes. This thick and tasty chili has some heat to it from the smoky chipotles, but it’s not spicy in an evil or painfully hot way. It blends and mellows with age, getting even better-tasting the next day as the flavors develop. And it freezes beautifully, too, though in our house we have to make a concerted effort to have any left over to freeze! Serve with grated extra sharp cheddar, avocado and creme fraiche to make it even more decadent. So I present to you my signature “Holy Mole Turkey Chili,” which has been served to and loved by many, but was somewhat of a closely guarded secret recipe until now. True, it has a few ingredients to it, but really isn’t hard to make once your mise is en place. My husband makes his own chili powder each year by grinding a special mix of dried chilis and other spices, which is especially good, but I make this with good quality store bought chili powder just as often. If you can’t find the ancho chili powder in your area, you can just leave it out…but make the extra effort to get the Chinese Five Spice…it adds a lot of flavor and sweet exotic spice to the chili, and makes one’s mind race thinking of other ways to use it, too! I hope you’ll try my spicy, decadent turkey chili and let me know if you agree with my friends and family that this is an outstanding recipe! Heat the oil in a large dutch oven or large heavy stock pot or soup pot over medium high heat. Add the peppers, onions, garlic and chipotle pepper and cook until veggies are soft, stirring frequently, about 10 minutes. Add the chili powders, Chinese five spice, salt, red pepper flakes, black pepper and bay leaves, and stir constantly for about 1 to 1 1/2 minutes to cook the spices, being careful not to burn. Add the tomatoes with their juices, the adobo sauce, the beans, wine, water and the chocolate, and stir well to melt the chocolate. Bring to a boil, then then add the raw ground turkey, crumbling and forming small clumps as you drop it to the bubbling mixture. Stir to mix the turkey in well, bring it back to a boil, then reduce the heat to simmer. Continue cooking at a low simmer for about 35 minutes until the chili is nice and thick, stirring occasionally and breaking up any large tomato chunks with the back of the spoon. Remove the bay leaves if using, taste and adjust the salt, if needed. Eat it as is, or even better, top it with some shredded extra sharp cheddar cheese, avocado and creme fraiche or sour cream. Serve with tortilla chips or a nice slice of homemade bread. This entry was posted in Chili, Food and tagged bell peppers, chinese five spice, chipotle peppers, Chocolate, Mole, Turkey Chili by bitsandbreadcrumbs. Bookmark the permalink. This looks good: the peppers and onions in photograph #1 look especially fetching. Thanks Sharyn! 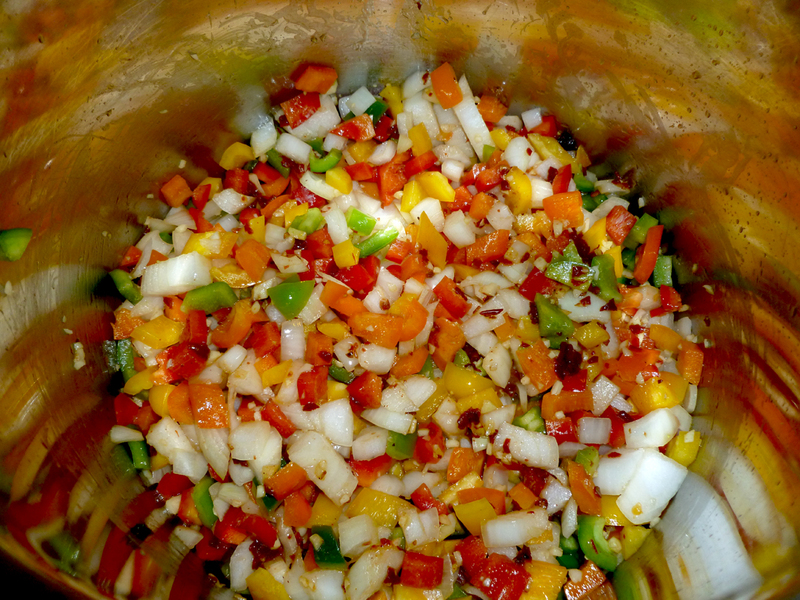 I thought that photo was the best of the batch…and the peppers and onions deserve the praise for being at the core of this chili recipe. Thanks Cecilia, we think it’s divine. That batch has been inhaled already! There is a very surprising ingredient in this chili, the five Chinese spice! My husband loves mole, and ground turkey is certainly so much healthier than beef. Very nice. This is kind of a multi-culti chili, really. The five spice idea came about because I was looking for that extra cinnamon flavor that is in mexican chocolate, but didn’t want to add straight cinnamon or the Ibarra to the chili. I had the five spice on hand and had never used it, and thought that combo of star anise, clove and ginger, as well as cinnamon, really kicked this up, pulling together and enhancing the chilis and chocolate. A little goes a long way, but it’s great. I’m starting to be a big believer in anise—it’s a component in many belgian quad beers, too! Sounds logical. By the way, I just nominated you for an award on my latest post. Wow, Eva, I am so honored. Thank you so much for nominating me, what a lovely surprise! Chinese five spice powder is well worth having around! The recipe looks fabulous. Thanks Carol! Let me know if you decide to try out the recipe….and I’m so glad the link issue is resolved! I can see how chocolate would work in a pot of chili but Chinese 5 spice is a new one on me. I like that you use 2 kinds of beans. All in all, this sounds like one great bowl of chili! I know it sounds crazy, but it just isn’t the same without the Chinese Five spice. It’s a very flavor-full chili, John!